413 pages | 98 B/W Illus. 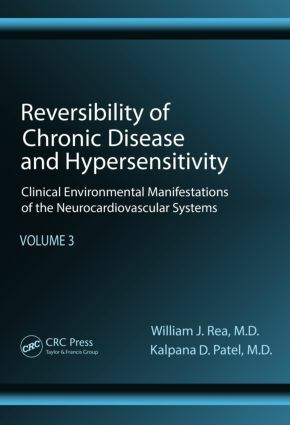 Encyclopedic in scope, Reversibility of Chronic Degenerative Disease and Hypersensitivity, Volume 3: Environmental Manifestations of the Neurocardiovascular Systems draws deeply from clinical histories of thousands of patients. It focuses on clinical syndromes within the musculoskeletal, neurological, and cardiovascular systems with a special focus on vascular dysfunction and heart failure treatment. The book explores mechanisms of chemical sensitivity and chronic degenerative disease, their manifestations, diagnosis, and approaches to reverse dysfunction. It covers a wide variety of topics including environmental sensitivity due to external pollutants, environmental control for reducing total body load, pollutant damage to vascular perfusion, altered blood volume, fluctuations of oxygen extraction, effects of endocrine on the vascular system, effects of pollutants on myocardial cells, and mechanisms in vascular damage. The book also discusses in detail a wide variety of clinical manifestations including vasculitis, cardiac arrhythmias, cardiac metabolic syndrome, myocarditis, atherosclerosis, heart failure, urticaria, and anaphylaxis. Treatment for heart failure is also discussed. The third volume of a five-volume set, the book provides an essential resource for health care providers diagnosing and treating chemical sensitivity and chronic degenerative disease. William J. Rea is a thoracic, cardiovascular, and general surgeon with an added interest in the environmental aspects of health and disease. He received his MD from The Ohio State University and was chief of thoracic surgery at the Veteran’s Hospital in Dallas. He has lectured on cardiovascular and thoracic surgery at the University of Texas S.W. Medical School and on environmental sciences at the University of Texas. Dr. Rea served on the board of the American Academy of Environmental Medicine and is currently a board member of the American Board of Environmental Medicine. Dr. Rea is a fellow of the American Academy of Environmental Medicine, the American College of Surgeons, and the Royal Society of Medicine. He was part of the team who resuscitated Governor John Connally when President Kennedy was shot. Kalpana D. Patel is a pediatrician with an added interest in the environmental aspects of health and disease. She serves as an assistant professor of pediatrics at the State University of New York at Buffalo. Dr. Patel was awarded the Jonathan Forman Gold Medal Award for outstanding research in environmental medicine and the Herbert J. Rinkel Award for outstanding teaching by the American Academy of Environmental Medicine. Dr. Patel has served as president of the American Board of Environmental Medicine and is currently a member of its executive committee. She has also served on the board of the American Academy of Environmental Medicine and is a diplomate of both the American Board of Pediatrics and the American Board of Environmental Medicine. Dr. Patel is a fellow of the American Academy of Environmental Medicine.